Under conditional water rights held by the city of Aspen since 1965, a 155-foot-tall dam would be built in this location on Maroon Creek to store 4,567 acre-feet of water. The city of Aspen is moving closer to reaching agreements with 10 opposing parties in water court to move the water rights to other locations. City of Aspen officials are hoping to reach an agreement by May 29 with the 10 opposing parties in two water court cases over the city’s conditional water rights tied to potential dams on Maroon and Castle creeks. While that timeline may be ambitious, one of the parties in the two cases, Double R Creek Ltd., which owns a residential property that would be flooded by the Castle Creek Reservoir, recently signed a settlement agreement with the city. 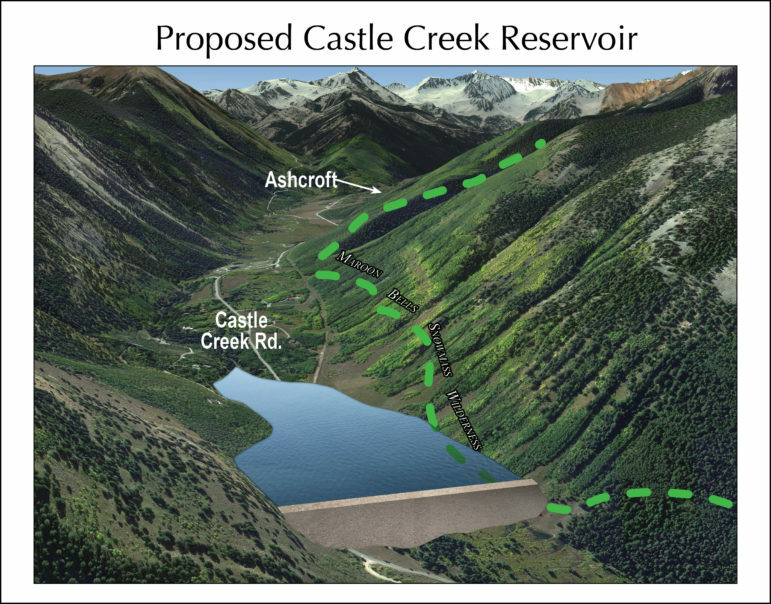 The potential Castle Creek Reservoir, which would store 9,062 acre-feet of water behind a 170-foot-tall dam 2 miles below Ashcroft, would flood portions of the residential property owned by Double R Creek Ltd. It also would flood residential property across Castle Creek owned by Asp Properties LLC, which also is opposing the city in water court. The Maroon Creek Reservoir would hold 4,567 acre-feet of water behind a 155-foot-tall dam, located just below the confluence of East and West Maroon creeks on U.S. Forest Service property, within view of the Maroon Bells. 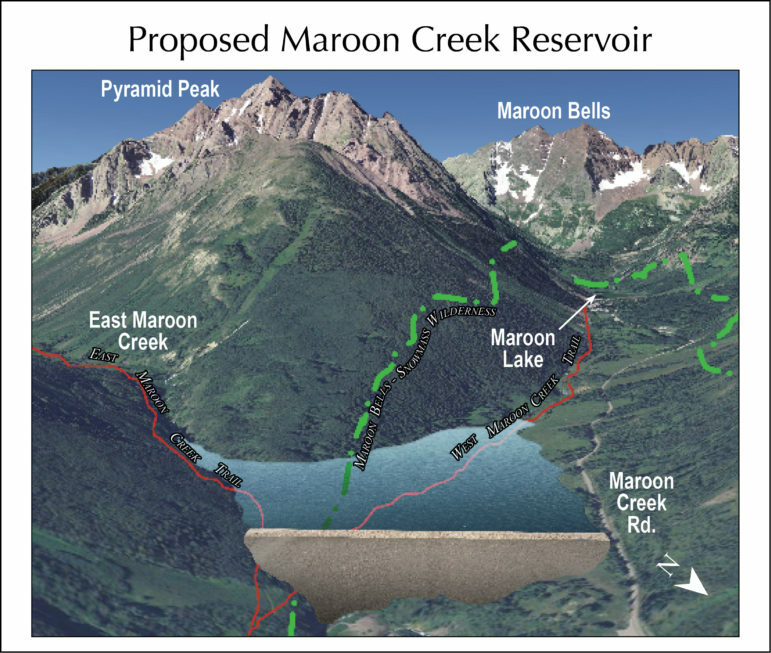 A graphic from Wilderness Workshop that shows how the potential Maroon Creek Reservoir would appear behind a 155-foot-tall dam just below the confluence of East and West Maroon creeks. Under similar settlement proposals sent to all the parties in the cases, the city would agree to move its conditional storage rights out of the Maroon and Castle creek valleys to six other potential locations in the Roaring Fork River valley, according to sources close to the court cases. If the change in location of the water-storage rights is approved in water court, the city could retain the right to transfer as much as 8,500 acre-feet of water storage across those locations, down from the potential combined total of 13,629 acre-feet in Castle and Maroon creeks, but only in those six new locations. The locations include the existing gravel pit in Woody Creek on land the city recently purchased for water storage next to the gravel pit, on the city’s golf course, on the Moore Open Space near the roundabout, on land near the Burlingame housing development and on the Cozy Point Open Space at the bottom of Brush Creek Road. On May 29, city staff plans to present the signed agreement with Double R Creek Ltd. to the City Council in a regular public meeting for its final review and approval. They also are working to present signed agreements, or stipulations, with the other nine opposing parties in the cases, as well. Outstanding areas of agreement among some of the opposing parties and the city revolve around assurances that the city won’t try and move its conditional rights, fail in its attempt, and then return to seeking to maintain its conditional rights in the Castle and Maroon valleys. Patrick said the agreement he signed on behalf of his client includes those assurances. An illustration prepared by Wilderness Workshop of the potential Castle Creek Reservoir, based on plans filed by the city of Aspen with the state in 1965 to create water rights for the reservoir. The city is now moving closer to reaching agreement with parties opposing the city’s 2016 due-diligence application to maintain the rights. 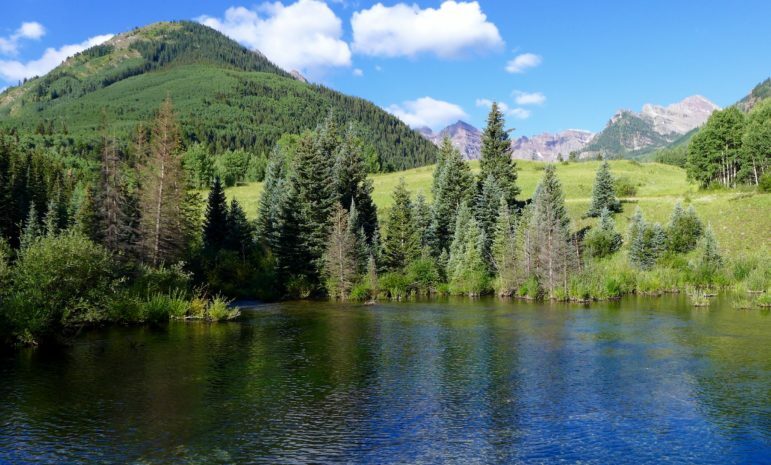 The other parties in the two cases include two property owners in Maroon Creek, Larsen Family LP and Roaring Fork Land and Cattle Co., Pitkin County, the U.S. Forest Service, Wilderness Workshop, Western Resource Advocates, American Rivers, and Trout Unlimited. In October 2016, the city submitted two due-diligence applications for the reservoirs and the cases attracted opposition from 10 parties across the two cases. In July 2017, the city announced its intention to move the conditional storage rights out of both valleys and has been in negotiations with the opposing parties in the case since then. On Tuesday, the city’s water attorney, Andrea Benson of Alperstein and Covell in Denver, updated the Division 5 water court referee, Susan Michelle Ryan, on the city’s settlement efforts. “Since the last status conference, I believe we’ve made some good progress toward settlement with all of the opposers,” Benson said. Paul Noto, a water attorney also with Patrick, Miller and Noto, is representing American Rivers, Trout Unlimited, and the Roaring Fork Land and Cattle Co. in the cases. “We’ve been working with the city toward settlement, and it seems like we’re making progress, and we hope to have the case wrapped up shortly,” Noto said Tuesday. She also said the city’s position is that all of the parties in the case need to agree to settle for the final deal to be struck. “We think we’ve been able to come to a place where we are all going to get what we want, or close to it,” she said. Aspen Journalism is covering water and rivers in collaboration with The Aspen Times. The Times published this story on Wednesday, May 9, 2018.